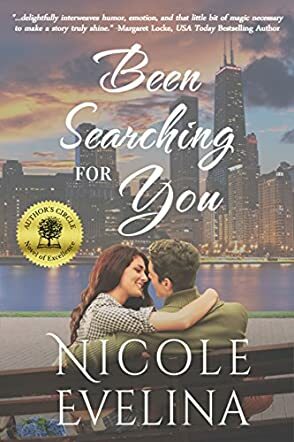 Been Searching for You by Nicole Evelina is a realistic, enchanting love story that is inspiring. Annabeth is a hopeless romantic who has a yearly tradition of writing to her future love. Determined to change her single status, and with help from her friends, she tries out different events, hoping to meet Mr Right. But how will she know who is Mr. Right? Is he the one she meets from the dating website? Or is he an old friend she reconnects with? Take a leap and join Annabeth on her journey to find her soul mate. I loved this book. Nicole Evelina's novel touched my heart and I couldn't put it down. The romance was especially sweet, but was tempered by the drama of what it really means to be in a relationship. The getting to know someone, the compromises, and the mixing of work and home. Each aspect was showcased and it only made the relationship that much more enjoyable. While there were some characters which I rooted for more than others, I enjoyed their multifaceted personalities, and when it came to the romantic gestures, I fell in love a little bit more. The plot was well written and not overtly sexual, and while chemistry is essential with your potential mate, so is the meeting of minds. Evelina blended both themes very well that showcased the characters' flaws and strengths very clearly. I recommend this book to all die-hard romantics and those who are looking for something new to try. A wonderful book to read and share with your friends.